I have always been a lover of sweet potatoes… at Thanksgiving. Besides the typical mashed sweet potatoes I make with candied pecans and then of course the trending sweet potato fries I just don’t really cook with them that often. Not because I don’t love them, but because I just really only know one or two ways to make them. The other night I saw recipe for Mexican stuffed sweet potatoes and I thought to myself, okay interesting. And then the next week I happened to get two perfect sweet potatoes in my organic produce box. Coincidence, I think not. I knew these sweet potatoes were destined to be something different and fabulous. They became the primary filling for sweet potato burritos. And they were wonderful! 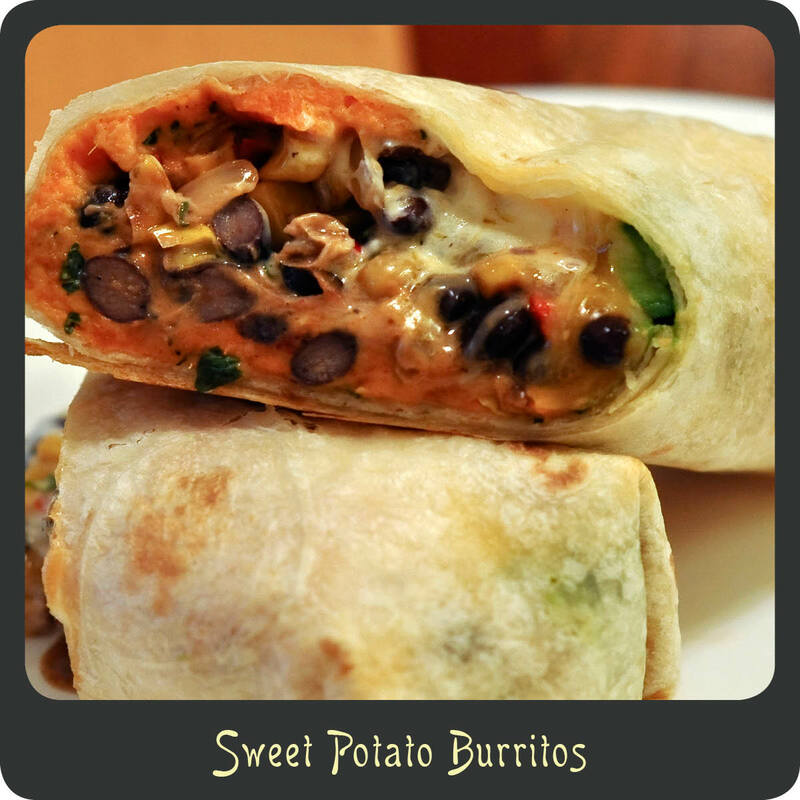 These sweet potato burritos are flavor packed, healthy, and unlike anything you have ever had before. The sweet potato really takes on a while new identity when mixed with these strong Mexican flavors. Since I am trying to serve one vegetarian meal a week in our house these were perfect but they would also be great with some grilled chicken or even an added scoop of rice. Why not try something totally unique and give these a try. Note: This makes approximately 8 burritos. I wrapped my extras up in saran wrap minus the avocado and they freeze and reheat great. Perfect for a speedy lunch later down the road! Bake the sweet potatoes for 45–60 minutes or until they are fork tender. Remove the sweet potatoes from the oven and allow to cool. While sweet potatoes are cooling place the corn in a large skillet and cook over medium-high heat. Roast the corn for several minutes before stirring. Let it roast for a few more minutes until the corn is brown and roasted on the outside. Add in the butter, onion, garlic, and jalapeño and cook until onions are translucent. Add the black beans to the skillet and allow to continue cooking on lowest heat. Cut the sweet potatoes in half and scoop out the meaty insides into a bowl. Coarsely mash the sweet potatoes with the cream cheese, sour cream, salt, cumin, chili powder, and lime juice. Stir in the cilantro. Heat up your tortillas in the microwave or stovetop. Spread each tortilla with a layer of the sweet potato mash and add a scoopful of the corn mixture to the middle. Sprinkle with shredded cheese and add in the avoado. Roll up the burrito and continue repeating until all the fillings are gone. As you finish each burrito place them in a baking dish. Bake burritos in the oven for 10 minutes to melt the cheese and brown the tops of the burritos. Remove burritos from the oven and serve. Can’t wait to try this recipe…looks delicious!! I definitely will!! You have some awesome recipes! =) Thanks for posting them!! I made this the other day and they were amazing! I’m making them again today. Thank you for the delicious recipe!